Horizontal loops of tubing (shown) may be used if you have the land. Are you looking to replace your home's current heating system or make repairs to an existing system? If you're researching geothermal heat pumps, you are probably already aware of the many benefits, including high energy efficiency and its ability to both heat and cool your home. Geothermal heating has many pros, but its expense in some cases can make it prohibitive depending on your property type. Dr. Energy Saver will let you know if this system will work for your home. Contact your local dealer today and discover the benefits of energy-efficient heating! Just like the refrigerator in your kitchen, heat pumps use refrigerant to "pump" heat from one location to another. Ground-source heat pumps take advantage of the fairly consistent temperature of the earth, where it's always warm enough to turn liquid refrigerant into a gas. When this phase change occurs, heat is absorbed. The refrigerant gas now gets pumped through a compressor, which increases the temperature of the gas by putting in under pressure. The hot refrigerant vapor moves indoors to heating coils. As the refrigerant gives up its heat to the interior air - heating your home - and is allowed to expand, it condenses back into a liquid and the cycle repeats. During the cooling season, the cycle reverses so that interior heat can be absorbed and pumped to the earth. 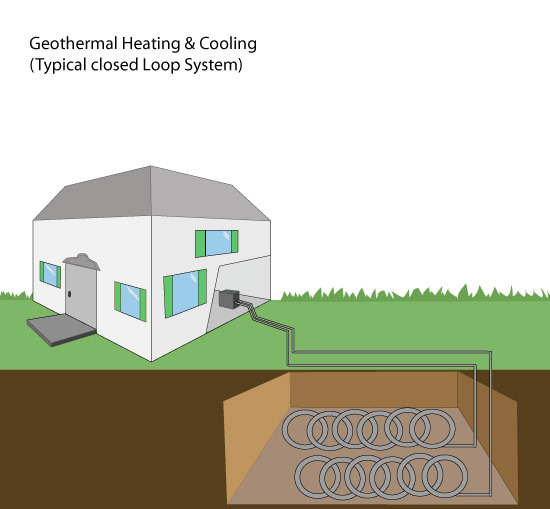 Geothermal heat pumps rely on a renewable resource — the steady temperature of the earth. But this type of HVAC system is also popular because it's very energy efficient compared to other heating and cooling options. The Environmental Protection Agency estimates that a geothermal heat pump can reduce energy consumption up to 44% compared to air-source heat pumps, and up to 72% compared to an HVAC system that combines electric resistance heat with standard central air-conditioning. The two factors limiting more widespread adoption of this advanced HVAC system are cost and installation requirements. 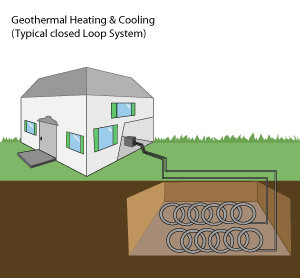 Long runs of plastic tubing, installed either horizontally or vertically, are required to transfer heat to and from the earth in a geothermal system. Both options are expensive and require enough land. However, a newer geothermal system called "direct-injection" geothermal is proving to be more affordable (and more appropriate for smaller plots of land) because shorter runs of underground tubing are required. To see if geothermal heating is the right fit for you, or to repair your current system, talk to Dr. Energy Saver. We have plenty of home heating solutions that will provide comfort and lower utility costs in your home. Contact your local dealer to schedule a home energy audit!